Your "hotel alternative" near Venice, Padova and Treviso in a lovely village called Noale where you can relax and enjoy the real venetian life. 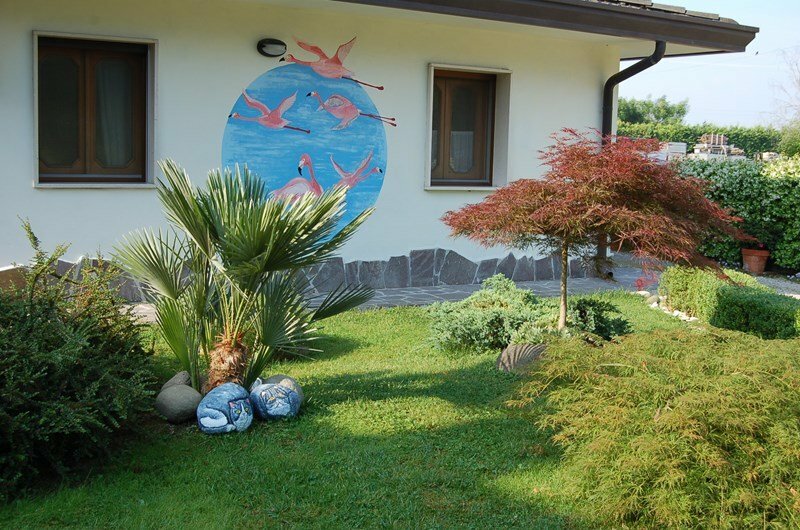 Property is a cottage composed of two apartments of 150 square meters each, just renovated. The self catering apartment is the one at the ground floor so no steps must be done. The apartment is very spacious and there is a fully equipped kitchen, a big living room with two sofa ) ,fire place and a small studio and WI FI internet access is available anywhere in the house. A double room plus another room with a double bed is available and a big bathroom with shower . The house is fully furnished and linens , towels are also included in the rental costs. Kitchen : is fully furnished with avon, microwave, dish washer, fridge, toaster, pots, etc...table for 8 people. Washing machine and iron plus table is also avaible. Living room : sofa , fireplace, 42 Plasma TV with satellite and DVD. PC and internet connection plus WI FI internet access from any part of the house. Bathroom : fully equipped with shower. Wood floor is in any room of the house. Air conditioning and central heating, wood available for the fire place. Linens, towels are also provided. Big garden with automatic gate, bike also available. Full programs of all events will be provided to you at your arrival.